Llamas are domesticated mammals closely related to camels. The two species look strikingly similar, although the llama lacks the camel’s signature hump. Llamas have worked for centuries as carriers and modes of transportation; their wooly fur is even regularly used to make blankets, ropes and clothing. So closely integrated into communities, llamas live alongside humans filling the role of both working animal and pet. Llamas are relatively large mammals; they stand around 4 feet tall at the shoulder, though their elongated necks can easily add another foot or two, with an average weight of 250 to 300 pounds. A llama has a long neck and limbs, a rounded muzzle, a bit of an underbite and a cleft upper lip. Each of a llama’s feet has two toes and a thick leathery pad useful for maneuvering rocky, uneven terrain. As for fur, it’s long, shaggy and wooly and comes in a variety of colors. 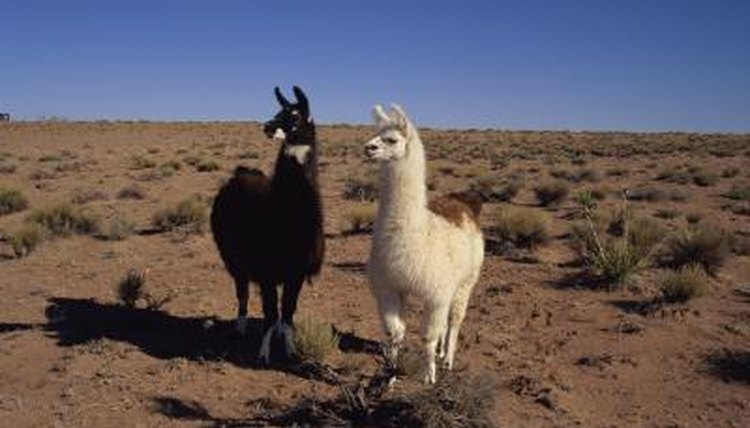 Curious and sociable, llamas enjoy working with each other, people and even other animals. A communicative species, llamas are vocal -- using a series of calls, hums and clucking sounds to communicate and warn of predators. As social, pack animals, llamas prefer to live in groups of around 20 individuals. A llama pack is comprised of roughly six breeding females and their offspring as well as an alpha male. Dominance is extremely important in a llama pack, and the alpha male will defend his position aggressively if warranted. Llamas are herbivores, preferring to munch on low shrubs, lichens, grasses, seeds, grains, roots and other mountain vegetation. They graze throughout the day and, like cows, regurgitate their food and chew it as cud. Because their natural habitat -- the Andean highlands in Peru -- is very dry, llamas have adapted to small amounts of water. They only consume around two to three gallons of water and only eat around 1 to 2 percent of their body weight in food each day. Llamas can live for up to 25 years and females can reproduce for 15 to 20 years. A sexually mature female llama will live in a harem of about five other females and one dominant male. They tend to mate in the late summer and early fall, giving birth to one infant each year. A newborn llama weighs around 22 pounds. What Is a Wild Cow? What Places on Earth Do Moose Live?